I found some awesome shadow boxes on clearance for just 3.99. The boxes are by K and company and come stuffed with 12 x12 papers and embellishments. I liked them so much I went back and bought 2 more. I may have to stop and see if they still have some on my way to Felicia's Scrapbooks this weekend. 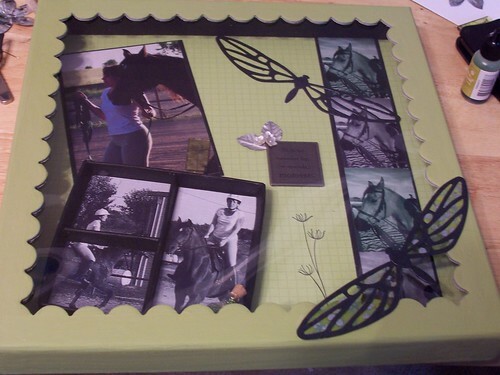 I've been dreaming up a special project for my friend Laura and this shadow box fit the bill. She has a horse, Mojo, and was so kind to let Simon and Lizzy have several rides on him one day. While I was there I took a lot of pictures of the kids and then when she let Mojo pick up the pace, I took some pictures of her. She has a really neat office that is painted green and has lots of inspiring things in. I wanted to make a little piece of inspiration (I hope!) for her. 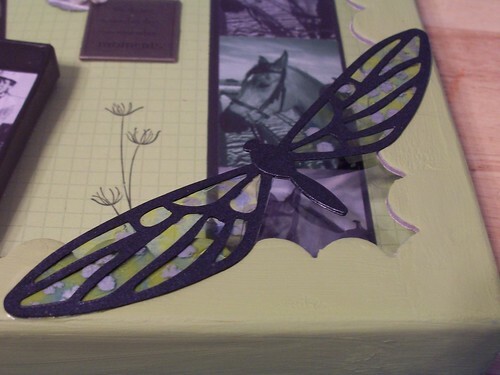 The dragon fly was created with the new Tim Holtz die Fanciful Flight. Instead of cardstock, I used acetate and alcohol inks to create the stained look for the dragonfly on the outside of the box. The inside dragon fly only has the body and the "skeleton" part of the wings. If you haven't used this die it is pretty awesome. 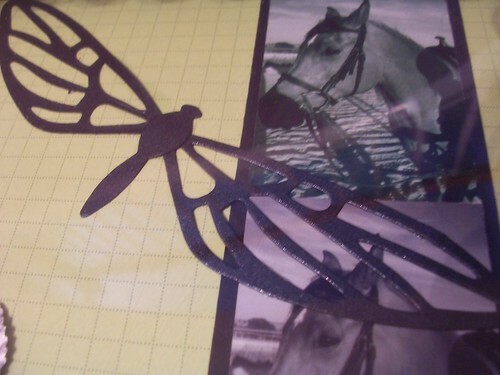 You can cut both the detailed and the solid parts of the wings out of different materials to get a really pretty look. Plus the die can make numerous different bugs since all the pieces are separate. Another interesting element I made was the little clear piece on the color photo. 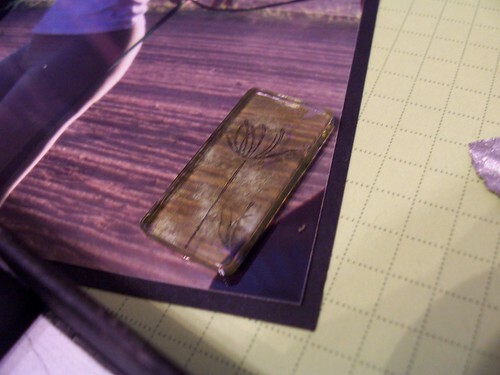 I utilized a Tim Holtz Fragments (I think he is my new scrapbook god) with some more alcohol ink. Then I flipped it over and stamped the silhouette stem in black Stayzon. If you stamp it on the same side as the alcohol ink it isn't as vibrant and if you use and metal additive (like I did with silver) the ink tends to not stick where the additive is. And a final view with the lid off to stop the glare. 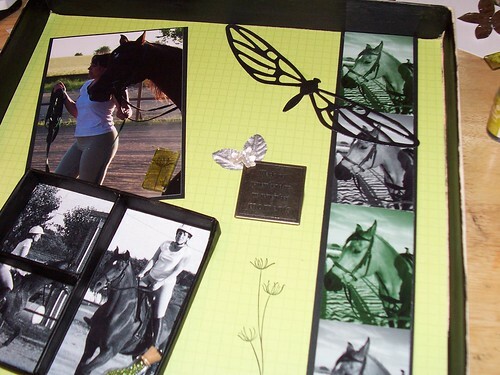 The horse photos on the side are Mojo but I added the green tint to some of of the photos and just printed in a wallet size. 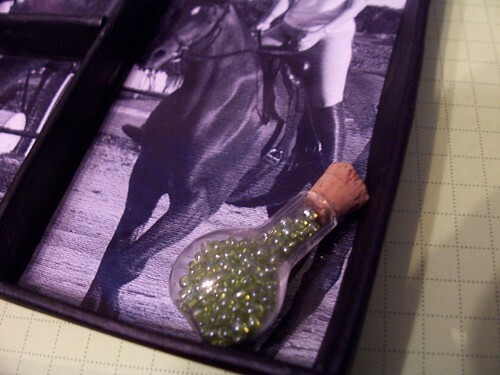 The little bottle was found in the beading section (I could easily get lost in there but I need another habit like a hole in the head).